What Causes Hayfever Symptoms at Dawn and Dusk? Home > Ask Our Experts > What Causes Hayfever Symptoms at Dawn and Dusk? My hayfever usually begins before dawn and in seconds I'm sneezing,streaming, sore throat, etc. I sleep with windows closed (horrible) to avoid pollen floating in! It is seasonal, so I don't think it's dust mite allergy. A friend who is a radio engineer wonders whether it is triggered by changes in ionisation of the air just before dawn and dusk - he mentioned the 'Heaviside layer'. This sounds a bit whacky but I'll listen to anything at the moment! Have you ever heard this in connection with allergy? The Heaviside layer theory is very interesting. There is such a thing – it's officially called the Kennelly-Heaviside layer and it has nothing to do with being heavy. It is named after the two scientists who predicted that it exists – Arthur Kennelly, an American engineer and Oliver Heaviside, a physicist working in the UK. They both came up with the idea that such a layer of the atmosphere existed in 1902 but it took another 22 years before it was actually detected by the physicist Edward Appleton. The Heaviside layer consists of a band of ionised gas that occurs around 55 miles above the surface of the Earth and extends about 40 miles, all around the globe. It is a reflector of radio waves and is one of the reasons why radio waves can be sent across large distances. The radio waves travel in straight lines but they bounce off this layer and back down to Earth, so they make it well past the horizon. There is no evidence that the layer has anything to do with pollen, or none that we can find... but it is fascinating that the layer changes according to what time of day it is. At night, the solar wind pulls at the atmosphere so this layer is further away from the surface of the Earth. During the day, the solar wind presses the layer closer to the Earth. So, there must be a change that occurs at dawn and dusk. It’s enough to affect how well radio waves are propagated but it is difficult to imagine that this would have much effect on you, sleeping in a bed inside a house. Could a change in the atmosphere 55 miles up possibly change the pollen distribution of the air in your room? It sounds a bit unbelievable. Often, in science, people say the best thing to do is to look for the most likely explanation, as this is the one that is most likely to be true. The increase in hay fever symptoms that you experience at dawn and dusk is probably related to the fact that plants produce most pollen at these times. Pollen output of all plants is highest between 5 am and 10 am and again around dusk. 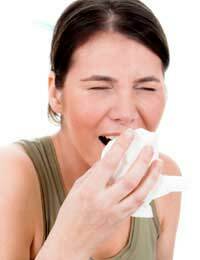 Hay fever can be triggered by a very small amount of pollen and pollen grains are very small. As you don’t live in a house that is airtight, pollen is able to enter the house through air vents, the roof space, air spaces in window frames and all sorts of little nooks and crannies. The reason for the worsening of your hay fever around dawn and dusk is simply that you are breathing in the most pollen at those times. But the good news is, it may not make any difference if you keep the window closed or have it open. So if you find it horrible to be shut in a night, try opening the window. If it makes no difference to your hay fever at dawn, you might as well enjoy the cool night air! @leo. Have you checked this out with your GP? You may also also be allergic to other things? Food cravings often indicate a deficiency in a vital mineral, vitamin etc that that your body needs - and the other side effects you mention do not seem to be a common allergice reaction. Hello, My case with hay fever is a confusing one. For a very long time now i would say about 5 years i have suffered from hayfever year round. Once the allergic reaction starts not only does my nose run like crazy, but i start craving food along with the food craving i start to sweat and get very heated. This happens every once in a while, but it is still incredibly annoying. I would like to know if you have any info on why this might occur, because to me is seems like very unusual symptoms.